Friday 14 September 2018, 6.00pm, Presbyterian Church Hall, 91 Tenby St, Wanaka. Professor Alison Downard, Principal Investigator of The MacDiarmid Institute. Dr Ojas Mahapatra, Alumnus of The MacDiarmid Institute. 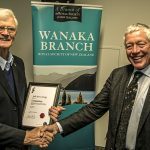 The Wanaka Branch of the Royal Society of NZ is proud to host the MacDiarmid Institute’s annual Regional Lecture Series. Join us to hear MacDiarmid Institute Principal Investigator, Professor Alison Downard, and MacDiarmid alumnus Dr Ojas Mahapatra, speak about how science (and hi-tech research in materials science in particular) can grow a high-tech economy and wealth for New Zealand. This talk “MacDiarmid Science – to Industry and Beyond” will focus on science as it heads from the lab to the marketplace, and on pathways for MacDiarmid alumni heading from universities into hi-tech industry. The MacDiarmid Institute for Advanced Materials and Nanotechnology is a government funded Centre of Research Excellence. The Institute pulls together the best materials scientists from around New Zealand. Materials science underpins all high value manufacturing and the MacDiarmid Institute has a proud record of spinning out new high tech-companies, and a long history of cross-collaboration with industry. Professor Alison Downard is a Principal Investigator with the MacDiarmid Institute and teaches Chemistry at the University of Canterbury. She is part of a MacDiarmid research team working on exploring ways of attaching nanoscale coatings to surfaces to give materials new and improved properties. She is passionate to show how collaboration between engineering, materials science and chemistry can create new science and bring new economic and cultural ambitions. Dr Ojas Mahapatra did his PhD with The MacDiarmid Institute at the University of Canterbury, Christchurch, where he “had the chance to work on extremely sophisticated, million-dollar equipment which you can brag about all your life!”. He is now the CEO of Photonic Innovations Ltd, a NZ start-up that specialises in manufacturing laser based gas leak detection equipment for industrial health and safety.